Aries Standard Vane Gear Installation. The Aries Vane Gear works on the servo pendulum system in which the vane operates a servo rudder which can swing sideways. This sideways motion is transmitted to the tiller or wheel by ropes and blocks. 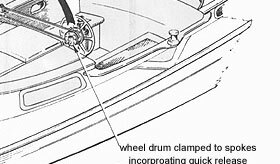 The Gear only has to develop enough power to move the tiller or wheel to steer, which easily obtained from the servo rudder through its length and leverage in pulling the steering lines. The Gear is suitable for virtually every type of yacht up to 55ft L.O.A. The minimum sized vessel is usually around 28ft. 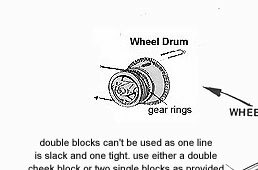 L.O.A due to the Gears mainframe weight of 50lb being unacceptable on smaller boats unless they have broad stern sections. Fin keel/skeg rudder design yachts which have inherent quick helm response do not cause any oversteer problems with the Gear. 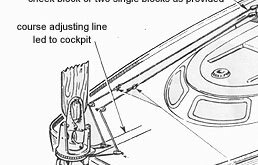 The two mounting tubes coming from the Gear can be bolted to the aft deck or transom using the standard clamps, bolts and timber packing blocks. 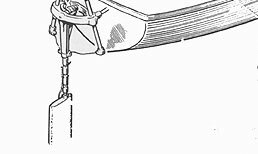 The movement of the steering lines is connected to the tiller by a simple clamp into which fits a length of chain. 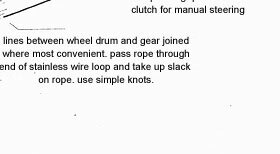 This arrangement allows an instant engagement or disengagement of the gear as well as having an adjustment to compensate for weather helm (don't use cleats screwed to the tiller - I think the chain is much better). 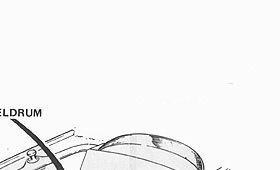 It is impossible to steer by hand with the Gear working and an instant disengagement is essential.